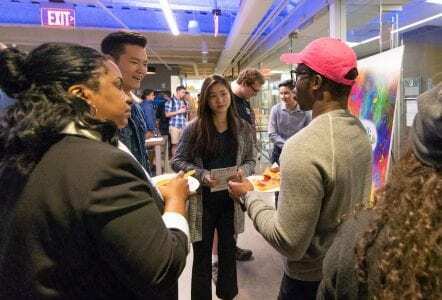 Last Wednesday, six established Accelerate startup teams headed to Workbar’s Back Bay location to pitch their business ideas to an attentive gathering of students, established entrepreneurs, and WorkBar members. Engaging conversations about innovative ideas paired with food and drinks, leading to the perfect environment for current program participants and recent Accelerate alumni to share their exciting new ideas with the numerous different representatives from Boston’s innovation and entrepreneurship community. 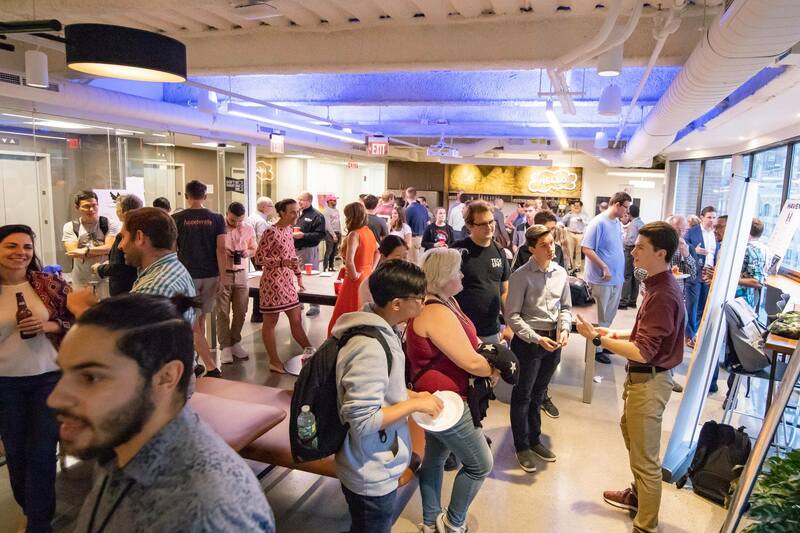 A quick stroll through the welcoming event space at Workbar was all one needed to capture the essence of Boston’s startup culture. 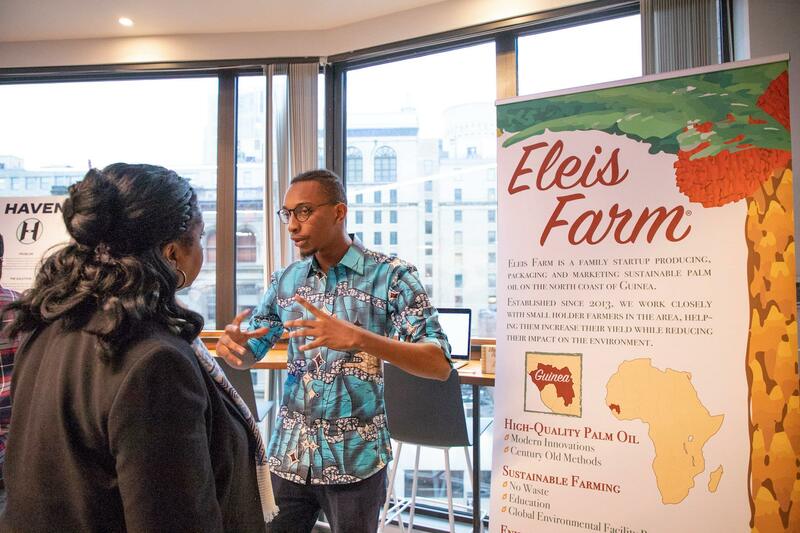 Inspired students shared their groundbreaking business ideas with local industry professionals, who were happy to share their perspectives with the next generation of startup founders and CEOs. Walter Kuketz, a well-established entrepreneur who recently exited a successful startup venture, remarked that he stopped by because he enjoys the excitement of networking events. “It’s always great to meet students who are ready to tackle big societal problems with even bigger ideas,” he said. Mr. Kuketz shared that his perspective was complemented by those on the Cranial Care team, a new startup looking to revolutionize how pediatric medicine treats plagiocephaly, a rare condition that leads to flat skulls in infants. Treatment is possible, but is oftentimes costly for families and extremely painful for the babies. This reality led Cathleen Hallinan, a sophomore student in Wentworth’s Biomedical Engineering program, to develop a skull cap prototype that has the potential to be far more affordable and comfortable than other treatment options available today. After recognizing a need for a better patient experience, she decided to act. “The biggest reason I wanted to pursue my idea through Accelerate is because I knew it presented the best opportunity to pursue my idea while simultaneously increasing awareness for the condition of plagiocephaly,” she said. Needless to say, such inspired perspectives were common among those participating in the evening’s Hot Seat event. Each team had a distinct enthusiasm for solving challenging problems, regardless of their chosen industry. This passion was appreciated by the many WorkBar members in attendance, who were glad to have the opportunity to share their perspectives with members of Accelerate. Paul Lewis, a current WorkBar member and freelance financial writer, mentioned his enthusiasm for a previous Accelerate + WorkBar ThinkTank event, noting that such gatherings presented a great opportunity for established professionals to learn from students with fresh ideas and perspectives on some of today’s most challenging problem. At first glance, Thursday’s Hot Seat event was such a captivating experience for those in attendance that it seemed almost impossible to effectively capture. Yet David Lewis, a FinTech professional with decades of business experience – who also happens to be this year’s Accelerate Entrepreneur-in-Residence – managed to do so. Upon reflecting on his time in dynamic and technology-friendly cities around the country, he shared his thoughts on Boston’s startup culture. “Many tech-centric cities have tremendous ecosystems for young entrepreneurs to tap into – but Boston provides a tremendous community, and in communities you give back,” he said. Such a succinct perspective manages to encapsulate the essence of the Accelerate + WorkBar partnership, which clearly allowed for one of the most successful Hot Seat events in Accelerate’s history.